WASHINGTON (CNS) — For centuries, men have formed a band of brothers as they faced the enemy on the field of battle, but now in the U.S., military women will soon be on the front lines, too, and Catholic women who have served in the military or are training to do so after college have mixed feelings about the new directive. “There’s something special about that bond. It makes for a cohesive unit,” said Sue Reininger, a veteran of the Air Force who lives in Colorado Springs, Colo., and attends St. Peter Parish in Monument, Colo.
“What’s so wrong about men bonding? That happens on the front lines,” she said in reaction to the ruling issued by then-Defense Secretary Leon Panetta allowing women to serve in ground combat roles. Reininger graduated from the Air Force Academy in 1989 and served in the Air Force on active duty for six years after that, primarily working at the Pentagon. On Jan. 24, Panetta revoked the 1994 Direct Ground Combat Definition and Assignment Rule for women. “The department’s goal in rescinding the rule is to ensure that the mission is met with the best-qualified and most capable people, regardless of gender,” he said in a statement. Currently, women make up close to 15 percent of military members on active duty and account for close to 20 percent of those serving in the Reserves. The new policy means direct combat positions on the ground — including infantry and artillery — must be open to women. There are women currently serving on most Navy ships and as combat pilots and they hold combat support jobs, including those in war zones. While the changes are expected to take a long time to put in place, women preparing to go into active duty service are enthusiastic. “Personally I’m excited about it,” said Isabel Lopez, a junior at Stanford University and member of a satellite ROTC training program at Santa Clara University in California. “And are we willing to accept the attrition and medical issues that go along with integration” of women in combat, she asked. 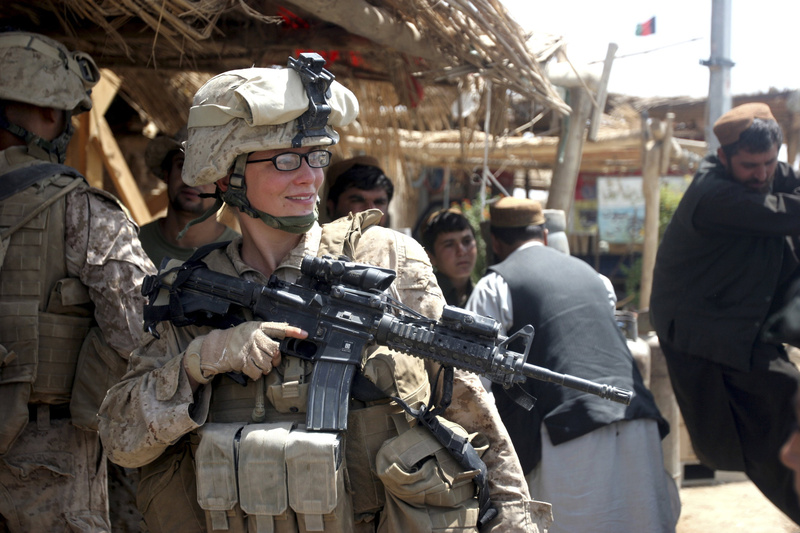 Deployed to both Iraq and Afghanistan, Petronio endured difficult conditions that left her with many permanent ailments — and a different opinion on women serving in that capacity. “Five years later, I am physically not the woman I once was and my views have greatly changed on the possibility of women having successful long careers while serving in the infantry,” she wrote. Brigitte Clark, a senior in the ROTC program at Santa Clara University, said men can have just as much of a physical or psychological problem from combat duty as women can. It just “depends on the person and their ways of coping (with it),” she told CNS. “Honestly I think the traditional gender roles are outdated,” she said, noting that the spouse not deployed stays at home, regardless of gender. “For me personally, I want to focus on my civilian career being a teacher” after her military service, she said, and spending more time with the husband and children she hopes to have. But if other women feel called to serve in combat roles, they should have the right to do so, just like any man, she explained. “I just feel it is fair, the right thing to do,” added Lopez about Panetta’s directive. “The decision is difficult and will definitely affect relationships and might affect mental health … although these are dangers along with a lot of other dangers, we can’t let this policy (be) stopped from being implemented, just because of (them),” she said. Allowing women full access to serve in combat reopens questions from the past about requiring women to register with Selective Service. The United States discontinued the draft in 1973, moving to an all-volunteer military. But most male U.S. citizens and male non-citizens living in the country ages 18 to 25 still must register with Selective Service. “In 1980, Congress and the president decided that they should not include women (in that requirement) because they were not included in the combat positions,” Larry Romo, director of the Selective Service, said in an NPR interview on Jan. 30. “Right now the great thing in the Army is that we’re all volunteers … so hopefully we can maintain that,” Clark said, but if the U.S. reinstates a draft, she does think there should be an obligation for American citizens to serve regardless of gender. But “to be a part of the military, they (should) have to pass physical standards,” she said. A February report released by the Office of the Under Secretary of Defense Personnel and Readiness said implementing the new policy on women in combat “will require significant resources, time, and effort.” It said the Defense Department needs to look at the “serious practical barriers,” which block many women from passing the difficult physical standards for combat troops. On Feb. 26, military leaders testified before the House Budget Committee on the impact of sequestration on the military, saying that implementation of new programs and directives, like the new policy on women in combat, likely will be placed on standby or slowed down considerably as the military cuts back on its spending overall. “Honestly I think that the families would work it out,” Clark said. “Whether it’s in a combat force or not, deploying just takes a toll on family because when the spouse is deployed, the other spouse has to take up the slack, (which is why) I personally chose to go Reserves and a noncombat role (so that I can) see my kid grow up,” she said. “I would hope to see the best of people and maybe having females on the battlefield might increase temptation because (they are more) … present,” responded Clark, but having a good foundation in the Catholic faith as a “good Catholic female (who) loves her husband,” can help too. Past a certain point, “we just need to hold people accountable” for their actions, added Lopez. Contributing to this story was Veronica Ambuul, assistant editor of The Colorado Catholic Herald, newspaper of the Colorado Springs Diocese.